Coming very, very soon to the SLink Mainstore. Watch this space for further information or join my subscriber kiosk to receive a notice. Alyx is $200L per colour and now available in the SLink Mainstore. I have spent a little time updating an old favourite of mine, the Neve Ankle boots. I was never really 100% happy with them so they have now got the same great design, but with new sculpts and updated textures for a more classic style. I’m very happy with them now and they are available on the wall at the SLink Mainstore! Everyone who has previously purchased them has been sent the updates for free! It’s amazing how much difference a little change in shape can make to a shoe! 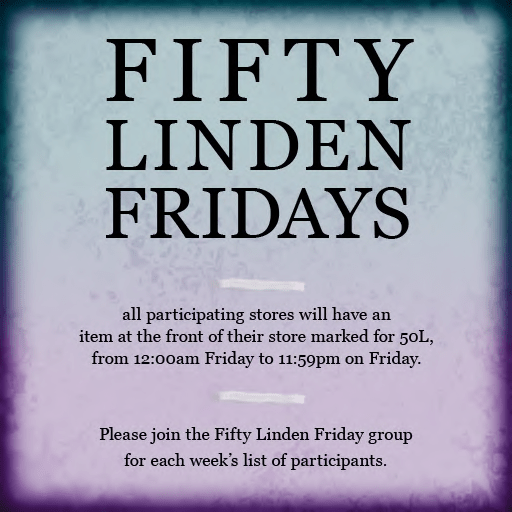 2 more hours to get the SLink Fifty Linden Friday Special! Only 2 more hours until I take down this week’s 50L Friday special burgundy version of the new Quinn Kneehigh boots! Get them while you can at the SLink Mainstore! SLink Quinn Kneehigh boots and Fifty Linden Friday! I’m excited to announce that I have been invited again to participate in 50 Linden Friday! The timing couldn’t be better as I have just finished these gorgeous boots and thought that it would be perfect to release a special colour for FLF along with the regular release! So here they are, the Quinn Kneehigh Boots. Available from Midnight at the SLink Mainstore. This burgundy is only available from 12 am – 11:59 pm Friday 9th of April SLT. Shown below is the FLF special colour! Unique in Second Life, these boots can be either open of closed toe (the boot toes, skintone, skin and nail textures and size are all controlled by the unique SLink OmniHUD as all my foot-in-shoe projects are) Included with each $650L colour pack are 2 large and 2 regular boots, and versions without invisiprims for those of you who have converted to the SL 2.0 viewer. Quinn Kneehigh boots, now available for $650L per colour, and $3250 for the 1o colour fatpack at the SLink Mainstore! Come and try on a free, fully functional demo now! !